The lead story on our local news this morning was about potholes. After the rough winter we have experienced already, the roads are a mess — with auto-damaging potholes on all the main thoroughfares. It reminds me of the way human life works. The issue here isn't to encourage you to be naïve or foolish. That's quite different from the little boy playing right field for his Pee Wee League team. A latecomer leaned against the fence and asked, "What's the score?" When the boy answered that his team was trailing 8 to 0, the kindly fellow said, "Don't be too discouraged. Maybe your team will do better next time." The kid didn't even look up. He just said, "It's okay. We ain't been to bat yet!" [The LORD said,]"Don't be afraid, for I am with you. Don't be discouraged, for I am your God. I will strengthen and help you..." (Isaiah 41:10 NLT). 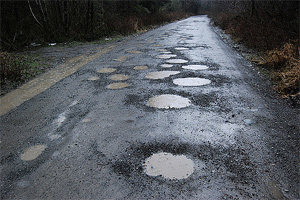 "Potholes Ahead" by Rubel Shelly is licensed under a Creative Commons License. Heartlight encourages you to share this material with others in church bulletins, personal emails, and other non-commercial uses. Please see our Usage Guidelines for more information.